[00:08:18] <dmess> what you checking out?? [00:10:13] <BigJohnT> you get your machine running? [00:18:55] <BigJohnT> what kind of drive is it? [00:22:59] <BigJohnT> the display (if it has one) lights up ok? [00:23:08] <dmess> this is the belief... but i want to control it from itself..
[00:24:47] <BigJohnT> is there a way to reset everything back to default settings? [00:26:17] <dmess> would that get me closer to what i want?? [00:27:39] <dmess> from the keypad buttons?? [00:28:45] <dmess> ok the reset it is... will i be able to if there's a p'word on it? [00:34:31] <BigJohnT> Q? The drive will not start! [00:34:40] <BigJohnT> ...This will start the drive. You will need an external analog signal to terminals 1, 2, or 4. Otherwise, go and change parameter 59 to a "1," then you can use parameter 58 for a speed reference. Out of the box defaults are set for "Three Wire" control. If all else fails, reset defaults to the drive, and try the steps above. [00:36:23] <dmess> would i want 59 to 1 and 58 for speed ref?? [00:38:17] <dmess> hmmm shall i go try..?? [01:25:17] <skunkworks> jmkasunich: upping gate resistance and adding the diodes seems to have fixed the funny ring also. [01:26:42] <skunkworks> pete had mentioned with is h-bridge - random failures because of the lower mosfets getting turned on by noise without the diodes. [01:52:03] <KimK_> I've been looking at Mesa's 7i65 8-axis servo card which also has 8 "extra" A/D inputs. Would the EMC2/ini/hal/ladder/whatever system be capable of using 2 as front panel pot inputs in this way: Pot 0 = rapid override (only affects G0's and similar); Pot 1 = feedrate override (affects everything but G0's and similar)? [01:59:31] <KimK_> OK. I'm used mostly to Dynapaths and Fanucs. In Dynapaths, operator picks one of two modes, rapid override (one knob affects all moves, good for initial debugging), and feedrate(?) override (doesn't slow down rapids, good for production). In Fanucs, you often have two separate knobs for feedrate and rapid override. [01:59:38] <KimK_> Any plans to add this? [02:03:26] <KimK_> OK. I'm sure it will come along eventually. I'll look forward to it. cradek, could you explain a little further your advice "(you use an encoder for feed override so you can change FO in more than one place)", for one place, do you mean more than one front panel location? I'm unclear on this. [02:03:48] <cradek> yes for instance the slider on the gui can also work. [02:04:31] <cradek> all of emc's gui works this way. you can control things from multiple locations. [02:05:37] <KimK_> sorry to be dense, but how would that be advantageous (in a CNC front panel situation)? [02:06:34] <cradek> one on the pendant, one on the panel, one on the gui on-screen - they don't fight. [02:06:45] <cradek> you can turn any of them up or down and the feedrate changes. [02:11:30] <KimK_> OK, I see. Yes, that does seem like a good idea, thanks. Same would apply to spindle override? Seems like it. And would your "as I've said before..." method be of any discernable difference from a rapid override? Same thing, but implemented more conveniently for the developers? Or would there be a difference? [02:12:15] <cradek> yes my 'feed limit' would be different - it would protect you from an errant G1 F9999 move. [02:15:34] <Jymmmm> SWPadnos: Back home I see, where did your travels take ya? [02:15:53] <Jymmmm> all biz, or fun too? [02:18:07] <cradek> KimK_: good question... I might not have noticed that problem. [02:19:11] <cradek> KimK_: but maybe I'm losing sight of the goal - is it not the case that the point of rapid override (or feed limit) is to make the program slow enough to preview safely? [02:19:44] <cradek> most often: is this approach going to stop in the right place? [02:24:29] <KimK_> Say, now that is an interesting idea... you may have hit on something novel and original there! An EMC2 exclusive?! [02:28:48] <KimK_> Totally new use for a jogwheel/MPG. Not in conventional way at all (where one click = one distance unit), but more as a "scratch player" plays thru a vinyl record. You turn the wheel more or less, faster or slower to move thru the program. I can't quite imagine all the ramifications yet, but that would be really cool. "Let's 'crank back' a little bit and see that fixture approach again..."
[02:30:13] <tomp> re: "one on the pendant, one on the panel, one on the gui on-screen". [02:30:13] <tomp> i just reduced a system to only 1 Fovr, 1 Rovr, 1 Sovr & 1 Estop on the hand pendant. [02:30:13] <tomp> the hand pendant nests into the operator panel near the lcd. [02:30:13] <tomp> the functions are always at hand. [02:30:13] <tomp> the single knobs always agree with any display. [02:31:25] <KimK_> tomp: I thought Rovr (Rapid Override) was not yet possible? [02:34:25] <cradek> SWPadnos: I've been meaning to put another estop button on the back of mine - it would take quite some time to run around it and stop it. [02:42:28] <cradek> KimK_: did you see my lathe video? [02:55:01] <KimK_> cradek: No, I had not seen that video, nice. Lots happening in 5 minutes. I lost count of the tool changes, LOL. What, facing (parting tool? ), drilling, turning, knurling, parting? Seems like I missed one or two. And what's with the woo-woo-woo on turret rotation, has it always sounded like that? And is that electric or hydraulic? [02:55:51] <KimK_> Oh, OK, that's unusual. Factory? [03:00:09] <KimK_> cradek: Congrats on getting a nice lathe going there. And what about the knobs, you mentioned they're for a front panel encoder, did you get these encoders retail? Anything you'd like to recommend to the rest of us? [03:00:37] <KimK_> And are you going to be selling knobs for them? [03:04:14] <cradek> they have a nice solid detent and count reliably. they have a pushbutton action too. [03:07:59] <spasticteapot> I have learned to use a lathe! [03:08:18] <spasticteapot> The problem is that the lathe does not work properly, and nobody around here knows where to get a replacement belt. [03:08:36] <spasticteapot> It's got a 1/2hp motor (which seems a bit small) connected to one of three spindles by a leather camera strap. [03:08:40] <cradek> what kind of belt? [03:09:00] <spasticteapot> My grandfather very likely worked on one of these. [03:09:03] <spasticteapot> On a destroyer. [03:09:08] <spasticteapot> In World War II. [03:09:56] <spasticteapot> Rather annoylingly, it would require me to take apart the entire machine to actually put a belt on it - the only easy way is to get a belt that can be opened up and closed. [03:10:07] <KimK_> spasticteapot: what is the belt cross-section size? is there a length, or is that to be established? [03:10:16] <spasticteapot> Cutting through some 3/32" copper (possibly thinner) took forty minutes. [03:10:28] <spasticteapot> KimK_: Belt length is adjustable. Belt width is about an inch. [03:12:15] <spasticteapot> I was thinking the latter. [03:12:27] <cradek> spasticteapot: don't start on copper. get aluminum or brass. [03:12:43] <spasticteapot> cradek: You can't get copper end-caps from Home Depot. [03:12:48] <spasticteapot> And it's not THAT bad. [03:12:55] <spasticteapot> Remember, I have to work unbelievably slowly. [03:13:14] <cradek> oh I didn't know you were actually making something - I thought you were learning to use a lathe. [03:13:24] <spasticteapot> cradek: I'm cutting pieces of pipe. [03:17:51] <cradek> so does it have a belt but it slips? [03:19:03] <spasticteapot> It is a camera strap. [03:19:11] <spasticteapot> Off of an old Pentax. [03:19:13] <KimK_> spasticteapot: McMaster-Carr catalog page 1020. 1" wide leather belting ready in 4', 5' 6' loops, or loose ends from a roll by the foot. See pages 1034 or 1222 for how to join. Pages 1018 for pulleys. [03:19:39] <spasticteapot> That looks pretty good, actually. [03:19:44] <spasticteapot> I though it would be rubber. [03:19:46] <KimK_> Oops, no, page 1018 for general info on belts and pulleys. [03:20:06] <spasticteapot> OTOH, I'm in Wisconsin. Using pieces of cow is appropriate. 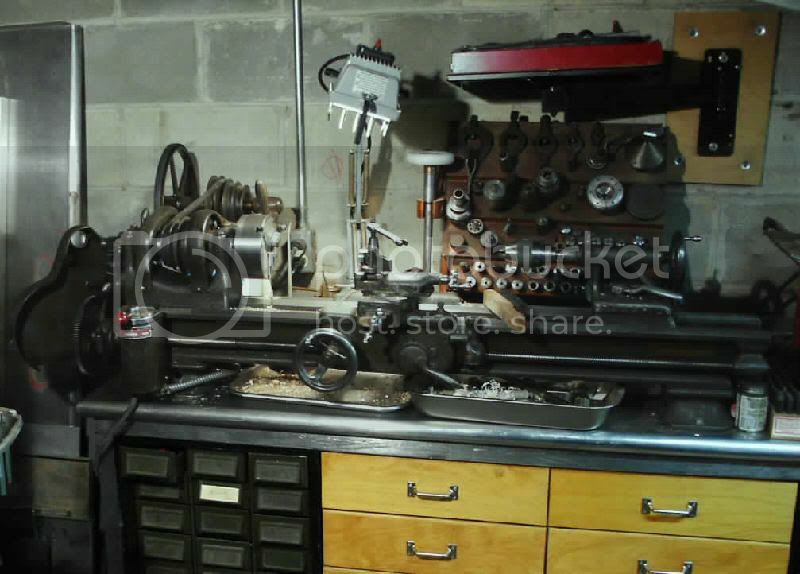 [03:20:25] <cradek> I've gone to the auto parts store and said "I need a serpentine belt about this long"
[03:20:40] <spasticteapot> As long as people are giving me useful information on lathes, is there a guide to what sort of sharp bits I would want? [03:20:40] <cradek> they say "what car?" and I say "I have no idea"
[03:20:51] <spasticteapot> cradek: I was just at AutoZone. [03:21:16] <spasticteapot> All of the belts are of the plastic-and-mesh variety that don't work properly once you've cut them and put them back together. [03:21:45] <spasticteapot> Also....is 1/2Hp enough? [03:21:53] <cradek> enough for what? [03:22:06] <spasticteapot> The metal bit seems to be spinning quite slowly, and without much torque - even when it's not slipping. 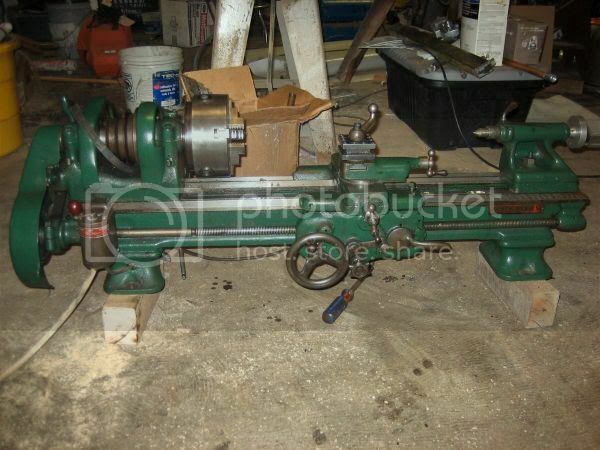 [03:22:15] <spasticteapot> cradek: A big old clunker of a lathe. [03:22:52] <spasticteapot> I think at least 1/2 of the power is being diverted to a huge mess of cogs and threaded things that I haven't found a use for yet. [03:23:07] <spasticteapot> cradek: I know that. [03:23:32] <spasticteapot> However, I have no desire to thread anything, and since it only feeds at one speed, I stall the motor if I'm using anything other than a 1/16" drillbit. [03:23:42] <spasticteapot> jmkasunich: I couldn't find one. [03:23:51] <jmkasunich> no nameplates of any kind anywhere? [03:23:51] <spasticteapot> I did figure out how all the cogs work and what the levers did. [03:23:58] <spasticteapot> jmkasunich: I'll look again. [03:24:13] <spasticteapot> It's sort of wedged into the back of a room full of spare things. [03:24:40] <spasticteapot> Yep - it's got one of those, right next to the little bar in front of the drive spindles. [03:24:48] <spasticteapot> It hasn't got a reverse, though, which I find incredibly annoying. [03:25:32] <spasticteapot> jmkasunich: Very similar, but the proportions are all wrong and it's basically bolted to the top of an old desk. [03:25:42] <jmkasunich> motor behind or under? [03:25:45] <spasticteapot> The motor is an old Sears special held on with plywood and hardware bits. [03:25:52] <spasticteapot> jmkasunich: Sort of off to the side at a funny angle. [03:25:58] <spasticteapot> I need to get a picture. [03:27:19] <spasticteapot> It looks like the guy who used to run the shop (who, unlike the current substitute teacher they hired until they can find a new one, was competent) found this by the side of the road and got to work with a screwdriver. [03:27:39] <spasticteapot> Except it hasn't got those two levers on the right. [03:27:43] <spasticteapot> Or the nameplate. [03:27:58] <jmkasunich> two levers on the right? [03:28:00] <cradek> which 2 levers? [03:28:02] <spasticteapot> And it's not quite as....smooth. [03:28:17] <spasticteapot> The ones under the little faceplate on the lower left. 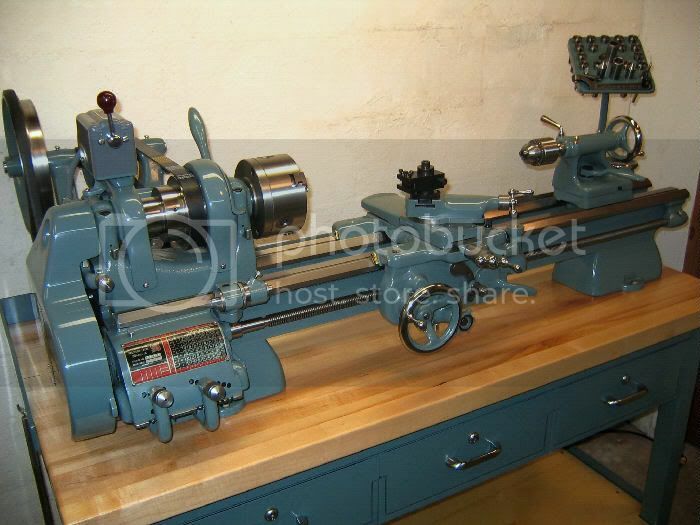 [03:28:27] <spasticteapot> jmkasunich: I mean that it looks like a much more crude lathe. [03:28:34] <spasticteapot> Possibly a knockoff. [03:28:41] <spasticteapot> I'm guessing it's just much older. [03:29:33] <spasticteapot> jmkasunich: Now THAT'S familiar. [03:30:30] <spasticteapot> I still don't think it has the lever on the lower left, though. [03:30:52] <spasticteapot> And I don't think you want to see the motor setup. [03:32:38] <spasticteapot> Ours is powered by a motor attached to the desk the lathe is mounted on with hinges and plywood. [03:32:43] <spasticteapot> Elegant, it's not. [03:32:49] <spasticteapot> It also won't reverse. [03:33:05] <cradek> the spindle won't, or the feed won't? [03:35:14] <spasticteapot> The feed reverses; the spindle does not. [03:35:20] <KimK_> a 1/2 HP motor might not be three phase, is it an old washing machine motor or similar? maybe it's single phase, reversing can sometimes be tricky. [03:35:32] <spasticteapot> KimK_: It says "Craftsman" on it. [03:35:38] <spasticteapot> It has a reset button. [03:36:31] <spasticteapot> This one wasn't built for the mill. [03:36:36] <spasticteapot> I think it was originally a bench polisher. [03:36:45] <spasticteapot> And it's not at my home, it's at my high school. [03:36:58] <spasticteapot> Of course, they have proper mills, but they won't let me touch them. Nor do they have classes. [03:37:11] <spasticteapot> Apparently, you can only learn how to operate a Bridgeport after a few years of Solidworks. [03:37:57] <spasticteapot> Things must have been very difficult when a Bridgeport was high-tech and a "computer" meant a man with cheap glasses and a pocket protector. [03:38:39] <cradek> spasticteapot: but how often did a whole room full of computers suddenly die if there's a thunderstorm? [03:42:04] <spasticteapot> cradek: I would point out that all of the rather impressive muscle car engines of the 60s were designed and machined without computers. [03:42:44] <spasticteapot> You don't need Autocad to make a ! @#$ doorknob. [03:43:29] <spasticteapot> A "Computer" was a man in the 50s. [03:43:51] <spasticteapot> The point is that I shouldn't have to learn CAD if I want to make things on a mill. [03:44:01] <cradek> who said you did?? [03:44:06] <spasticteapot> My high school. [03:51:00] <spasticteapot> McMaster Carr sells rubber belt quite cheaply, but you need a $450 machine to weld the ends together. [03:51:07] <spasticteapot> Leather it is, then. [03:52:32] <spasticteapot> Favorite label of the day: "Can be installed with hammer." [03:56:14] <spasticteapot> We have people using acetylene torches without goggles. [03:56:19] <spasticteapot> I think they're all idiots. [12:34:24] <alex_joni> how goes it? [12:34:51] <rayh> Trying to get ready for winter. First snow here. [12:57:18] <rayh> When you get it, you may have a bit of a trick figuring out what addy to use for it but it should show up. [12:57:30] <rayh> I haven't found one of these that didn't. [13:00:46] <rayh> Where in WI, Guest942? [13:07:03] <rayh> Gotta run. Have a great day. [13:18:01] <archivist> 20 past one! [13:29:28] <micges> is there hal component to convert float to bit ? [13:30:10] <micges> or u32 to bit ? [13:31:27] <Paragon> Just been looking at the pluto-servo .comp file what do the .SS in the """ comment section signify? [13:32:22] <Paragon> conv.comp.in ? Is that a comment parser of some kind? [13:39:52] <micges> where can I send it ? [14:31:20] <Paragon> The more I look into EMC2 the more I see comparisons with Verilog. This may be an exageration but the underlying abstraction apears similiar to me. Note that I am a novice in both of these technolgies. Just an observation is all. [14:33:37] <Paragon> :-) It just seems kind of similiar the way one wires components to gether to get to the required outcome. [14:37:20] <Paragon> Is there a kind of schematic designer already developed with in Emc? The reason I ask is that one could create .hal and posibly .comp's by picking black boxes that are already available from drop down menus and then wiring them together to get to the required system. [14:38:22] <Paragon> Would be a powerfull addition do you think alex_joni ? [14:39:22] <Paragon> Or at least a nice addition. [14:39:34] <archivist> or a stepconf style connection editor? [15:39:08] <cradek> Does free shipping still apply on "truck" shipping, like a 110lb vise? ... It did on my 12 x 18 surface plate and it was about 75lbs and cost only $25.00 ! I was considering using them for pavers in front of my shop door. [15:39:52] <Paragon> Oh Eagle ... Great product I've used it in the past with the gcode script to generate routes and then cut with EMC on my mill. [15:43:16] <skunkworks_> you could weld them togather and make one big table..
[15:44:56] <jepler> cradek: the note on the use-enco.com front page says "free *UPS* shipping on all orders over $99", so I'm assuming that doesn't include truck shipping. [15:45:54] <jepler> cradek: are you happy with that oil you're using for coolant in the lathe? [16:16:48] <jepler> cradek: do you use FPR or CSS for knurling? [16:19:54] <Paragon> What does NML stand for Chaps? [16:20:24] <jepler> it means "the rpc layer in emc that none of the developers care to deeply understand"
[16:20:53] <Paragon> rpc layer Remote Procedure Call ? [16:23:42] <Paragon> Right... Thanks for that. I just saw it mentioned in the HAL manual and was wondering what part it play. [18:47:21] <anonimasu> fragalot: gor pictures? [19:00:34] <fenn> what's an archive? [19:03:45] <fenn> "Archival records are normally unpublished and almost always unique, unlike books or magazines, in which many identical copies exist." like that? [19:07:35] <fenn> how do you scan a newspaper? [19:07:36] <alex_joni> fading the fastest? [19:07:45] <fragalot> fenn: same way you scan a book? [19:13:18] <anonimasu> yep, and then make a nice bonfite. [19:21:19] <maddash> jepler: how do you convert a PDM signal into an analog output? [19:21:24] <alex_joni> they might do the OCR if you supply the pictures..
[19:21:47] <fragalot> maddash: dont you mean pwm? [19:27:44] <archivist> with a load? [19:28:17] <skunkworks_> no real load yet - smallish servo. [19:28:40] <skunkworks_> alex_joni: I emailed him with a thank you. He is very nice. [19:34:13] <fenn> skunkworks_: is that the big servo? [19:35:36] <skunkworks_> no - next week for that. [19:36:34] <archivist> I presume this is for the beast mill? [19:40:44] <tomp3> Paragon: re: Eagle2Hal , I never wrote an interpreter or hooked eagle to Hal. it was an idea to use graphical netlists to replace .hal files. [21:39:01] <anonimasu> toastatwork: why are ou looking at that? [21:45:17] <toastatwork> are those legal in lmp? [21:46:43] <toastatwork> i guess they're just not quite as interested in downforce? [21:49:15] <anonimasu> err more is a bad choice of words. [21:50:13] <anonimasu> yeah, but downforce equals drag..
[21:50:37] <toastatwork> but that doesn't have anything to do with the weight of the car. [21:54:47] <anonimasu> toastatwork: downforce is a aid to keep the tires from slipping when cornering..
[21:55:52] <toastatwork> which brings me back to the original question - why the relative lack of aero elements on lmp cars? [21:56:18] <anonimasu> streamlining work slike that too..
[21:57:11] <toastatwork> is that enough? are the advantages of closing the wheel wells that large? [21:57:41] <anonimasu> if you have a smooth side..
[21:57:45] <anonimasu> then a [ hole..
[21:59:34] <anonimasu> look at the lmp bodies..
[21:59:48] <anonimasu> from the side..
[21:59:54] <toastatwork> what does the side have to do with generating downforce? [22:01:02] <anonimasu> Yes what about them? [22:01:56] <anonimasu> they are integrated into the bodywork..
[22:02:35] <toastatwork> so does an F1 body. [22:03:00] <anonimasu> close enough to a f1 car? [22:03:36] <anonimasu> google for a cfd image of a f1 car..
[22:06:51] <toastatwork> they're more streamlined - that does not default to more downforce. [22:10:20] <anonimasu> probably the biggest gain is drag reduction and the ability to shape the forflow over the car..
[22:10:48] <anonimasu> to create higher pressure zones..
[22:11:27] <anonimasu> how does airplane wings do it? [22:11:40] <toastatwork> you don't see airplane wings designed to generate maximum uplift. [22:11:47] <toastatwork> because that's kinda hard to fly. [22:12:57] <anonimasu> dmess: what do you say about that? [22:13:38] <anonimasu> Yes, but just to get a grip what downforce means..
[22:17:56] <toastatwork> is a statement that says "because of X on closed whee, it has higher downforce over open wheel equivilents"
[22:18:41] <toastatwork> who would win in cornering speed? [22:19:42] <toastatwork> shape the flow in such a way that it creates more downforce? [22:19:56] <toastatwork> parasitic drag is not an issue in cornering force, just in top speed. [22:20:30] <anonimasu> to let you shape the flow where you want it..
[22:20:49] <anonimasu> ie create higher pressure zones..
[22:21:27] <anonimasu> more surface area means you can shape more flow..
[22:22:59] <anonimasu> it means you can shape the airflow that goes over and around the wheels in a open wheed design..
[22:23:48] <toastatwork> but is it raining in Africa? [22:24:16] <anonimasu> how does a aircraft wind generate lift? [22:25:45] <anonimasu> yeah and flip a wing? [22:25:53] <toastatwork> uh, it's the same? [22:26:23] <anonimasu> and what are we looking at when we look at a lmp bodywork? [22:26:34] <toastatwork> look at the angle of attack of the lmp. [22:26:53] <toastatwork> Not exactly an aggressive value. [22:27:47] <toastatwork> shattering everything spectacularly. [22:28:32] <toastatwork> that leads me to wonder if that kind of behavior is an unfortunate side effect of design descisions, or is a fundimental aspect to the design itself. [22:32:02] <toastatwork> not if you can't give that wing any angle of attack. [22:32:10] <toastatwork> Or if you have to give it a positive value. [22:32:17] <toastatwork> the the design is going to take off. [22:32:52] <toastatwork> the ability to keep a flow laminar is not equvilent to saying you can turn that flow into a force generator. [22:33:55] <anonimasu> no, but if you can nudge that flow over the rear wing it ends up as downforce..
[22:38:39] <anonimasu> the closed wheelwheels are forbidden in f1 btw..
[22:39:19] <anonimasu> and they work around them in f1.. as the rules state they ahve to be open wheeled..
[22:39:47] <anonimasu> yeah, but as to why F1 dosent do closed wheels..
[22:40:03] <toastatwork> because nobody DOES run a car in f1 with closed wheels. [22:40:13] <toastatwork> so it's pure conjecture to say how it would fare. [22:40:57] <toastatwork> and i guess my real, real, real question is what if? [22:41:08] <toastatwork> would it look like an f1 car, with wheel fenders? [22:41:35] <toastatwork> could you stick a "front wing" on an LMP and make more power? could you seperate the nose out? [22:44:57] <anonimasu> maybe you should prove your theory..
[22:46:50] <anonimasu> I guess it boils down to the most efficient way to control flow based on how much money you can spend..
[22:47:00] <anonimasu> ie.. rule restrictions..
[22:47:16] <toastatwork> that would be so awesome. [22:47:28] <anonimasu> I love the stohr dsr concept..
[22:48:25] <anonimasu> err the invested time/money isnt avaiable..
[22:52:20] <anonimasu> the only solid fact anyone can state. [22:52:29] <anonimasu> err drag/turbulence.. that is. [23:00:51] <toastatwork> they take the car right into "undrivable"
[23:05:18] <toastatwork> i guess it's obviously time to petition the FIA to create a closed-wheel road racing analouge to f1. [23:05:24] <toastatwork> to answer this question. [23:06:27] <toastatwork> haha, "today all cars will be BLUE"
[23:08:40] <anonimasu> only race ever where they've been enforcing that rule..
[23:09:38] <dmess> worn stickers mean scrapped..
[23:13:56] <dmess> just so no one will ever find it and say it looks good..
[23:30:51] <dmess> and working for extended periods?? [23:35:56] <dmess> look up the Toshiba 200 QF boring mill on google..
[23:42:26] <BigJohnT> dmess: any luck on your drive? [23:47:00] <dmess> brb gotta fine the smallest child..
[23:49:15] <jepler> how big is the fine? [23:50:41] <jepler> cradek: sure, I'll come out in the next half hour or so? [23:56:10] <dmess> are you two local to one another?? [23:58:16] <jepler> cradek: my encoders are a .236 metal shaft--that's not anywhere close, is it?